Open Heart Magic's 3rd Annual Ann Arbor Benefit - Help sick kids get their magic back! Open Heart Magic, the charity that empowers young patients at C.S. Mott Children's Hospital, is hosting its 3rd Annual Ann Arbor Benefit on Friday, September 28th! Join A2's best and finest for an amazing night at the Polo Fields to help sick kids get their magic back in 2018. This event supports the growth of Bedside Magic in Michigan! What: A full open bar, heavy appetizers, raffles, a terrific Silent Auction, and more! 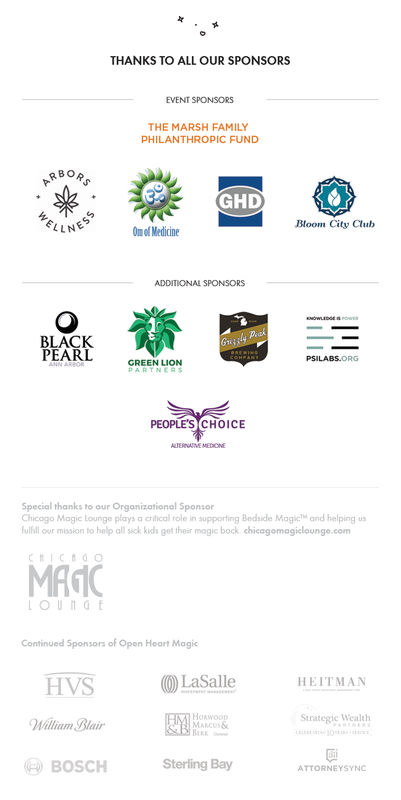 Want to sponsor Bedside Magic & support this event? If you would like more information, please direct any questions about our sponsorship opportunities to Becky Evans, Director of Operations & Development, at becky@openheartmagic.org. Questions about the event? Silent Auction Items to Donate? Ask Today: This event directly supports our mission of helping the sick kids at C.S. Mott Children's Hospital at that critical point in their treatment, please reach out to the Benefit chairs, Nader Salah, at nader@openheartmagic.org and Carl Hildebrandt, carl@openheartmagic.org for more information.